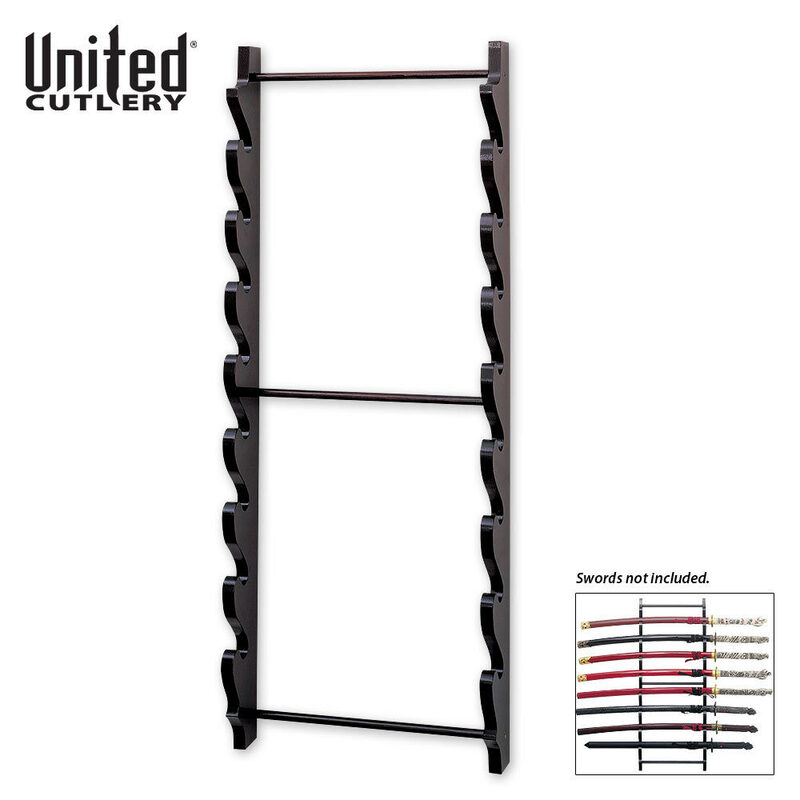 Dimensions: 15 1/2" x 39 7/8"
Display a complete sword collection with one of these elegant 8-up sword stands. Constructed of high quality hard wood with a high gloss black lacquered finish. 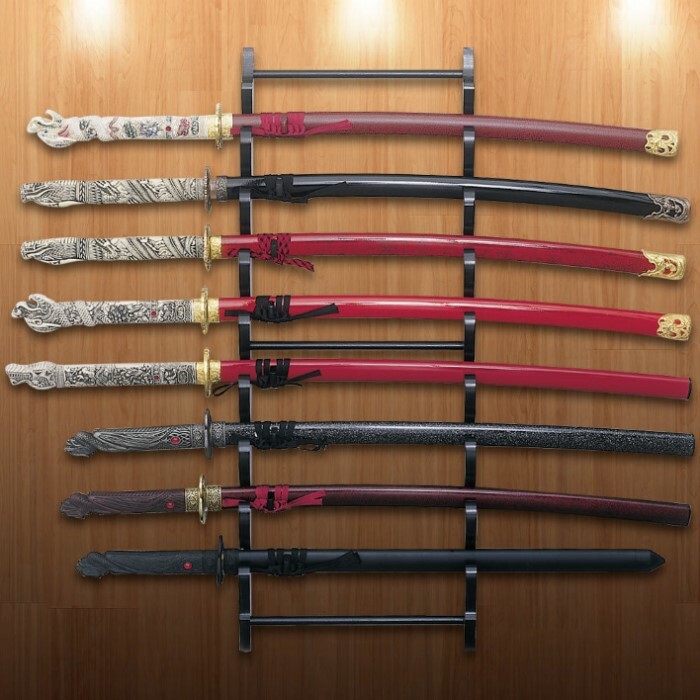 Displays 8 swords in a horizontal position. Approx 15 1/2" wide, 39 7/8" long. I'm using this rack for my swords PLUS (1 Samuri, 2 Rapiers, 1 German Officers dagger, 1 Tomahawk, 1 golf club, 1 fishing pole, 1 long Arabian blade.) Great display and easy to show. The price was great!! Thanks! For the Price this is an Excellent stand. I like this rack, seems bigger in the picture, but it is still big. I only wish it was silver like in the picture. TS really came through with this product. My original one had a defect and they really pulled through on helping me out with my issue. They contacted me by phone call and walked me through resolving the issue. Just got mine today and I have to say it is a little smaller than I thought but fit perfectly on my wall also needs some assembly but easy and the only issue I have with it is that it will leave black marks on your wall if not placed carefully. I have had this rack for awhile. I think it is a later model as the center cross-bar was tight enough with the supplied screws. Do be careful not to over-tighten the screws though. It is helpful to make a template of the four wall mounting screw locations so you can get them spaced properly. This will hold many things that have a diameter of less than 2 inches. I currently have an 8 foot spear, 6 foot staff, cane, 2 axes, a mace as well as swords. Wide bladed swords such as some two-handers and fantasy blades may not balance properly in the slots. Good sturdy stand and easy to put together. just gotta be careful cause the paint scratches off real easy. I've been using this rack for several swords for a while now and it seems to hold weight very well. I fastened it to a brick wall with med plastic anchors and drywall screws...good item!